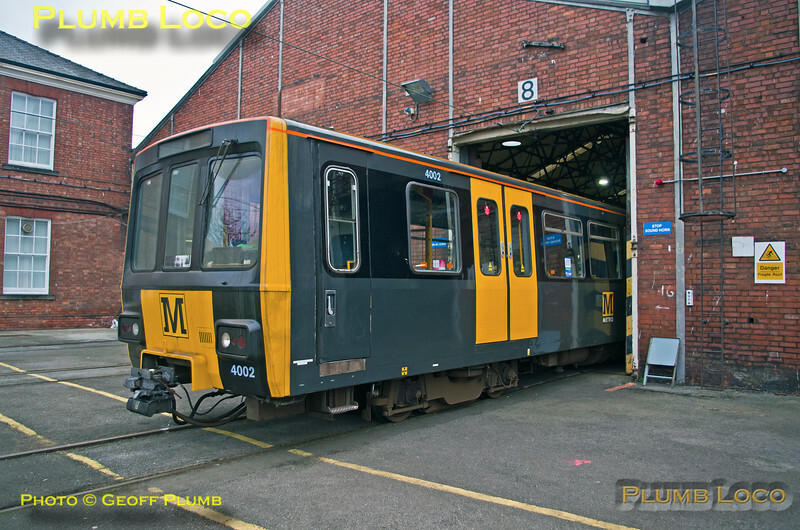 One of the two prototype Tyne & Wear Metro units, No. 4002, pokes its nose out of the depot building at Gosforth on Road No. 8. Together with No. 4001 it was built by Metropolitan Cammell Carriage & Wagon Co. Ltd. in 1975 and rebuilt by Hunslet during 1984 - 1987. These two units, plus unrefurbished Nos. 4040 & 4083, now form a reserve fleet. 07:48½, Sunday 25th February 2018. The cab unit from No. 4000 is on display at the nearby Stephenson Railway Museum. Digital Image No. IGMP34033.